Oh no! 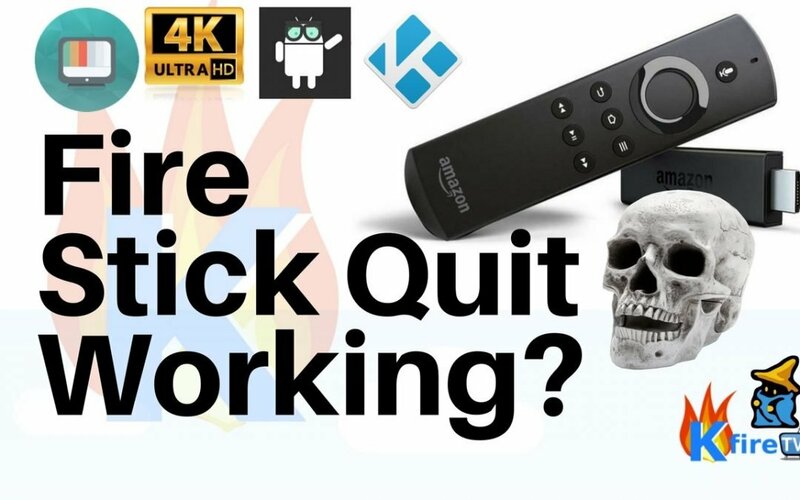 Your Firestick quit working! That’s a bummer. Better throw it straight in the trash. No wait, please don’t! You can fix it! On a serious note, there are better ways to get your Firestick working than buying a new one. Particularly with those pre-unlocked Firesticks you can buy, where they charge an extra $20+ for the 10 minutes of work you can do yourself in the next sections. But First, Does your Firestick Turn On? If yes, skip right over this section. If not, try some of the following solutions or check out Amazon’s troubleshooting pages. Check out the links below. First, check the batteries and the power supply to the Firestick or Fire TV. It may sound silly, but trying all the simple things first is easier than going through the complicated stuff. Next, try different HDMI ports on your TV in case one of them is uncooperative. Also, cycle through the HDMI inputs to make sure that it’s set correctly. You can hold the Up and Rewind buttons on the remote for several seconds. That will tell the system to start cycling through different resolutions. If something works with that, you can use the select button to pick the current resolution. If you haven’t used your Firestick in a few years, then there is a good chance you need to do some major software updating. Some of the less mainstream Kodi add-ons will stop working randomly. Other’s get shut down and have to start up again under a new name. Your Firestick should update itself when you plug it in. Make sure it’s up to date, using the following steps. Assuming Kodi (or your streaming media player of choice) isn’t working at all. You will need to delete the old one and do a fresh install. That’s for the best anyway since updates add essential security features, make playback faster, and have better support. You can also do this for anything else on your Firestick that you won’t use anymore. The Firesticks have relatively limited memory, so it’s good to clean it out once in a while. Plus, you want to make sure you have room for a new pre-configured version of Kodi so you can resume happily binging something. A pre-configured version of Kodi (aka Kodi Build) is your own customized version of Kodi, except that someone else put it together and does all the maintenance work. It’s like the difference in sitting down at a restaurant and ordering Lunch Combo #7 versus going to a buffet where you can select from a bunch of different things. The lunch combo is going to be faster, easier, and have a nice mix of several things. The Kodi build in this tutorial is Misfit Mods. It’s one of the best put together ones we’ve seen, and they do a great job of keeping everything up to date. That way you know you can just sit down and watch something without the fuss of trying to make sure everything works. Watch the video below or scroll down for written instructions. Specifically, Misfit Mods is Kodi 17.3 with a bunch of add-ons. You can customize your build to suit you once you start the install process. The build in this tutorial includes movies, tv shows, sports, and live tv. Once it finishes, you are all set. Enjoy! Once you get to this point, you are finished. There should be just about everything anyone could want within this build. But if it just doesn’t jive with you, then you can choose a different build and explore your options. Even if you don’t stream very much, it’s crucial to open Misfit Mods every once in a while so it can update. Kodi is fabulous in its ability to offer such an enormous variety of add-ons that you can customize to suit yourself. But there are several great alternatives as well. If Kodi isn’t your thing, try one of these to see if it suits you better. Terrarium TV is an alternative to Kodi’s movies and TV shows. It runs on Android so it is perfect for Firestick or your phone. The designers kept non-touchscreen devices in mind when building it. So it’s intuitive and easy to use. Terrarium TV can also download media to your device, whether that is a Fire TV or Android tablet. This perk gives you on-the-go options if you are stuck somewhere without wi-fi. Tea TV is even easier to use than Kodi. It works on Firestick and Android devices. The setup is easier than Kodi because you don’t have to fuss with all the add-ons. However, that step can be avoided with a Kodi build, like the one above. It gathers streams from varying sources, and since there isn’t a good way to verify those sources, using a VPN is a smart way to keep all of your information private. FreeFlix is a no-nonsense program. It does exactly what it says it does. There are no fuzzy words or obfuscations. You stream movies and TV shows easily. The setup is a little more involved than something like Tea TV. But it’s no more complicated than Kodi. The ShowBox developers built it for touchscreen devices. So while it will work beautifully on your tablet, there are a couple of extra steps to make it work well on your Firestick. You need an app called CetusPlay to work as a virtual mouse. ShowBox focuses on movies and TV shows. It’s user-friendly and doesn’t mess around with a ton of options most people will never use. Plex is a little different than the other Kodi alternatives listed above. It has a stronger focus on being a media server. You can also subscribe for $10 per month to stream from anywhere in the world. You can happily bypass country censorship when traveling. A more detailed comparison of Plex vs. Kodi will give you a better idea if this is the right service for you. We cannot recommend a VPN strongly enough. They encrypt your data and obscure your IP address and location. Covering your tracks can prevent unwanted headaches that nobody has time for. Also, all the information in this article is for information purposes only. We don’t condone copyright infringement in any way. What you do with this information is up to you. I loaded misfit mods without a problem and content icons display without a problem, but content does not play. Am I missing something? I know you could on the 2nd gen ATV, not sure about the rest.